APC Tenure Extension: Oyegun Surrenders? Opponents of tenure elongation have carried the day in the All Progressives Congress (APC). Its National Chairman, Chief John Odigie-Oyegun, last night bowed to pressure from governors and party leaders to forego tenure extension. He has summoned an emergency meeting of the National Working Committee (NWC) for 8am today to draw the timetable for state congresses and National Convention. The meeting will hold before the National Executive Committee (NEC) session begins at 11am. A member of the NWC told The Nation: “We were all shocked to get a text message inviting us for NWC meeting by 8am on Monday when all we were preparing for was the NEC session. “Some of us inquired and we were told that the NWC meeting will draw the timetable for state congresses and the National Convention for consideration by NEC. This was what we told him to do last Thursday. “We suspect that the latest development must have accounted for Oyegun’s U-turn. 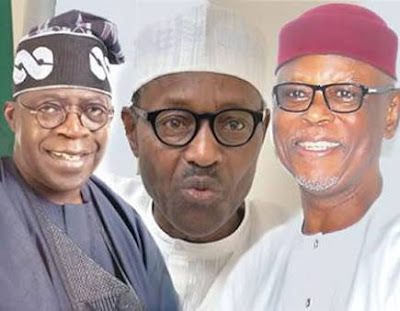 From the horse-trading so far, all the APC governors have backed out of tenure extension for Oyegun and the NWC. Another NWC member said: “I think summoning NWC meeting very early in the morning before NEC amounted to panic on the part of the national chairman. “Some of us were really amazed when we got the text message. This was the same Oyegun who did not allow us access to the report of the Governor Simon Lalong Committee which was set up by the NWC. “We had the whole weekend, he did not call for any meeting. Now, he wants to hold a pre-emptive meeting. There were talks last night that Oyegun might seek to recontest based on some governors’ advice. But, it was not clear if he would heed the advice. If he does, he would have to jostle for the seat again with former Governors Adams Oshiomhole (Edo) and Clement Ebri (Cross River). Investigation by our correspondent revealed that pro-Buhari governors reached out to NEC members to accept his proposal for elective congresses and National Convention. As at Friday, no fewer than 21 governors and their state chairmen had conceded that the party should conduct fresh election into party offices in order to avoid running into legal technicality on the nomination of APC candidates for the 2019 polls. A governor said he and his colleagues chose to rally round President Muhammadu Buhari because his proposal is the first major advice he would give to the party. He went on: “Unlike other past Presidents who will force their views on party members, Buhari was democratic enough to render advice and ask party leaders to consider the pros and cons. “If Buhari’s advisory is accepted, it will be a sign that his voice counts. But where NEC rejects his proposal, he would have lost the confidence of a key organ of the party. “You can see why we have regarded the NEC meeting as make or break. An endorsement of Buhari’s idea will also foretell his chances in the party if he chooses to seek a second term ticket in 2019. “So, some of us do not see it as one person hijacking the party structure or not but as a major test of a vote of confidence in Buhari. Another source said: “The NEC meeting will chart a new course for APC by confirming our ability to look inward to address our challenges without rancour. “If we get it right at the NEC meeting, it will strengthen the party to prepare for the 2019 polls. Otherwise, we may end up being divided. It was learnt last night that pro-Oyegun governors and party leaders may be seeking “soft-landing” by coming up with the concept of a “guided national convention” which will lead to the return of some NWC members. Another source said: “A few governors are calling for a guided national convention by which the return of some NWC members will be negotiated and delegates will be advised to vote for them at the convention. “They do not want to throw away the baby with the bathwater. They believe some NWC members have done fairly well and if their zones still want them, delegates should be asked to endorse them. But a NEC member said: “We won’t accept guided convention in view of the manipulation we have gone through in the past few weeks. “At least, we have secured two-thirds in support of Buhari’s proposal; we will go full blast for state congresses and national convention. Another governor, who responded to The Nation’s enquiry said: “We are no longer bothered about the tenure extension debate, we are comparing notes among ourselves on the appointment of the National Convention Committee. As at press time, it was learnt that some governors were still making a case for Oyegun’s return to office. But there were indications that Oyegun’s return has been rejected by Edo APC which is insisting that he must quit. “The APC leaders in Edo actually do not want Oyegun. In fact the state branch has filed a suit to oppose tenure elongation. “If Oyegun decides to re-contest, he might fight for the slot with ex-Governor Adams Oshiomhole and ex-Governor Clement Ebri. “I think Oshiomhole has an edge at present,” said a Northwest governor.